gonna paint my grille and headlight bezel trim and all the trim and around my taillights gloss black and have the rest of my car flat black. Better than being all spray canned flat. I can see the spray pattern in your hood for crying out loud. My advice..... go get a Scotchbrite pad & some water to make the whole car/truck look more uniform. I guess some wet sanding paper would do the same thing, but take longer. Grille should be flat or semi-gloss, but trim around it should be gloss if you go that route. Rago wrote: Better than being all spray canned flat. I can see the spray pattern in your hood for crying out loud. My advice..... go get a Scotchbrite pad & some water to make the whole car/truck look more uniform. I guess some wet sanding paper would do the same thing, but take longer. Grille should be flat or semi-gloss, but trim around it should be gloss if you go that route. im just mainly trying to get all the body work done before i get the car looking more uniform. i still have holes to fill from all of the trim that i took off. but i got the hole on my tailgate bondo'ed in for temporary til i can get ahold of a welder then ill start from scratch on it. alright i wish they sold spray cans of that black chrome. 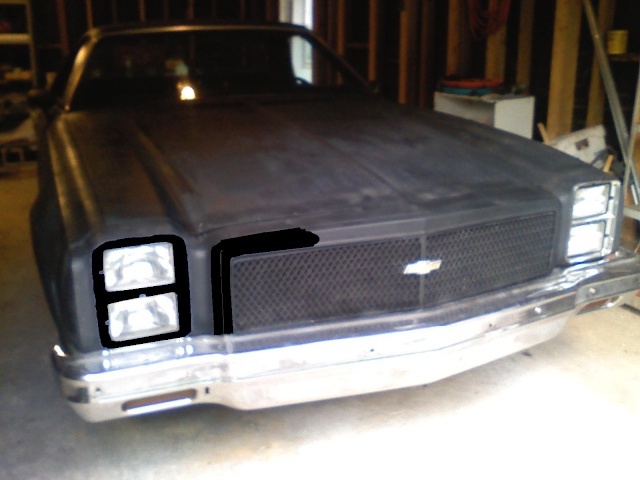 but im probably gonna black out all of the chrome except the bumpers, im gonna paint all the chrome gloss black and the trim piece around the grille. Good luck painting over all your chrome and making it look good. 74Malibu383 wrote: Good luck painting over all your chrome and making it look good. i already painted the trim around the headlights black and i think it looks 100 times better than the chrome, the only thing thats gonna be chrome on my car is the wheels and bumpers. hell i wish i could paint all the chrome to that black chrome like those wheels rago showed us a while back. might just paint all the trim gloss black and leave the whole front end flat black. You really need to get that all one uniform color before messing with the trim anyways. That primer job looks like A$$ IMHO. Just think of it this way. The more coats of rattle can crap you spray on it, the more you're going to have to strip when you're finally ready to paint it. Plus, if you stop spending money on the rattle cans and tape, you might be able to save up enough to get a used welder. At the end of the day it all goes back to that post in which you were talking about bondoing over your marker light holes. Just my $.02, but why even bother customizing something that you plan to sell? I you are going to keep it for a while then customize to your heart's content, but for something you don't intend to keep very long it's a waste of time & money that could be going into your Malibu. What looks good to you might look ugly to the next guy & gives him an arguing point on price when you sell it. Rago wrote: Just my $.02, but why even bother customizing something that you plan to sell? I you are going to keep it for a while then customize to your heart's content, but for something you don't intend to keep very long it's a waste of time & money that could be going into your Malibu. What looks good to you might look ugly to the next guy & gives him an arguing point on price when you sell it. I definitely don't disagree with you. Not that I believe in 2012, I just believe with idiots like the one we have in office weakening the country and China and other surpassing us, things could get real ugly in the next decade. ok i did a lot of painting and some bondo here and there, very very little. my opinion the car looks great! ill get some pictures in a few hours or so. haha i understand that but theres nothing wrong with me posting pics of my progress because maybe someone else on here (may not be you) is doing the same thing i am or is thinking about it and the pictures show them what it looks like.